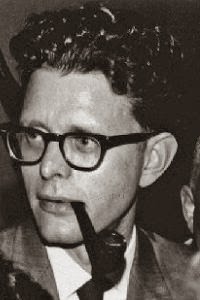 I always think of Poul Anderson as the author of high fantasy; heroes on quests, the rescue of delectable maidens, and the like. Actually, he was a remarkably successful and very prolific writer of hard science with a clear appreciation of alternate viewpoints and the consequences of actions. I suppose my perception was clouded by the parallel universe tale, "Three Hearts and Three Lions" (1953) and "The High Crusade" (1960), which was a wonderful story about medieval Englishmen sailing off in a space ship to wage intergalactic war. Certainly the latter was very much on my mind when I met Poul and his wife, Karen, in the early 1960s. I had only recently discovered science fiction fandom and met them at the first convention that I attended. Poul was a delightful man, and after some conversation and a little snuggling we wound up falling asleep in an armchair together in the convention suite, while the party around us wound down into the early morning hours. That was my introduction to one of the finest authors of science fiction's Golden Age. Poul's books enthralled me. They still do. They are well-written, with fascinating plots and protagonists that are fully developed instead of the usual cardboard cut-outs that used to characterize so much science fiction. They show a firm grasp of the scientific principles that underlie the best of the sf genre and, perhaps even more important, they present the underlying viewpoints and psychological motivations that drive both hero and villain. Poul's books are about real people caught in extraordinary circumstances and doing the best that they can with the situation. The Andersons were a very hospitable couple and quite welcoming to fans. Over the years they hosted many parties at their home in Orinda, California. It was a standard thing for fans living in Los Angeles to leave after work on a Friday, drive the 370 miles to the Anderson's house, spend the rest of the night in sleeping bags on our hosts' floor, and then party all Saturday night and leave on Sunday for the drive back home. We were young and had a lot of stamina those days! The first time that I drove up there with friends we could not find the right street; Orinda, which is within commuting distance of the Bay Area, being one of those hilly, heavily wooded, suburbs like the Hollywood Hills or the Oakland Hills. We did, however, locate the Orinda fire station, which had a huge map of the area on one inside wall and a very nice fireman who showed us how to find the place. I remember one later trip where four of my friends alternated driving the van we were riding in with teaching one of the passengers how to play poker. Poul was easy going and willing to talk at length about practically any subject. He had a degree in physics from the University of Minnesota and I remember one conversation in his office where he was talking about orbital mechanics to a group of us, and I took exception to the idea of an orbit enduring forever. He merely shook his head over my lack of belief. He loved to sing, but what he produced was more like declaiming or chanting because he was tone deaf. In my memory I can still hear him chanting "The Ballad of Bowie Gizzardsbane," by John Myers Myers, after telling his young daughter to "Bring Daddy a beer from the fridge and don't skip on the way back." Other songs that were favorites with him were Kipling's "Ford o' Kabul River," and "Rimini." I do not know who set those poems to music, but I heard Poul sing them enough times that I was eventually able to sing along with him. My voice isn't all that hot either, so we made a good duo, and fans who felt that their ears couldn't take that much outrage went into another room. Theirs was a pleasant, medium-sized, house with a sloping lawn and a patio in back where Karen, who is a strong-minded and enterprising woman, once hung up and dressed out a road-kill deer, which she then butchered for the family larder. One of the bedrooms had been converted into an office for Poul and when I carelessly referred to it as his "study" he corrected me immediately, since the IRS was very hawk-eyed about residence space being claimed as a business deduction. The Andersons had a large black cat named Courl after the alien in A. E. Van Vogt's "The Black Destroyer." Sometime during one weekend the question came up as to whether cats or dogs made better pets. Reaching up to one of the book shelves that lined his office, Poul took down a volume of Kipling's poetry and, with great sensitivity and feeling, read aloud "The Power of the Dog," a perfect answer. 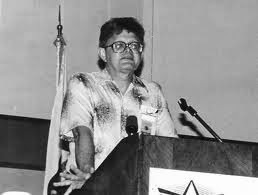 He had a great sense of humor and there was a time during one convention banquet when one of the waiters at the Andersons' table dropped a boiled potato on the floor which promptly bounced. With wonderful presence of mind, Poul wrote a little ditty on the spot to immortalize the occasion: "Bouncing Potatoes," to the tune of "Waltzing Matilda." I remember another convention, where a bunch of us – fans and pros – were packed into a room party where even open windows couldn't bring in any air. It was Cleveland in 1966 and the weather was sweltering. Naturally, the iced beer provided by the hosts was very popular. Fred Pohl started a bottle of stout, but decided that he didn't care to finish something with that strong a flavor. I promptly carried it over to Poul Anderson, who waved a thank-you to Fred Pohl and happily finished it off. I kept the empty – and told people that it was a bi-polar beer bottle. Silly times, but we had a lot of fun. If you like this series of profiles, you will want to read J. D. Crayne's two absorbing short story collections on you Kindle, Invisible Encounter and Saturn Stolen.